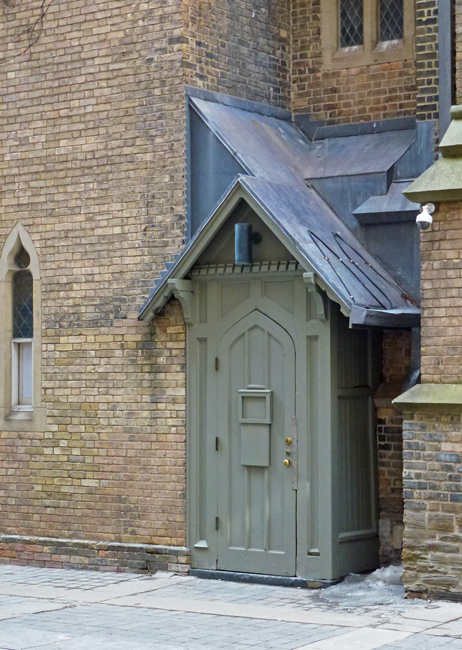 While wandering around the outside of the Church Of The Holy Trinity I discovered this small door tucked into a recess at the back of the building. I have no idea what it leads to but someone spent a lot of time making it look church-like don't you think? After finding out about the fire at the front door it is good to see a camera up beside this one. It is very church-like and it makes me wonder where it leads. I also wonder what the square on the door might be for. I wonder if it leads into office space. A nice little door, Pat. This door looks like it was build as an afterthought. Perhaps it is much newer than the church. I like your photo. Great door with a little loket for announcements. Perhaps some service entrance but very nice made. Cozy entrance, and does it have a little opening in the center? A very interesting mysterious looking door! It is a fine little entry way. Nice find.